To cut unemployment from near 11% back to 7% in the early 1980s, you could employ a lot of people who had been out of work for less than six months. And you see that that's what happened. But there's just not that much room to cut unemployment by putting the short-term unemployed back to work in this latest recession. 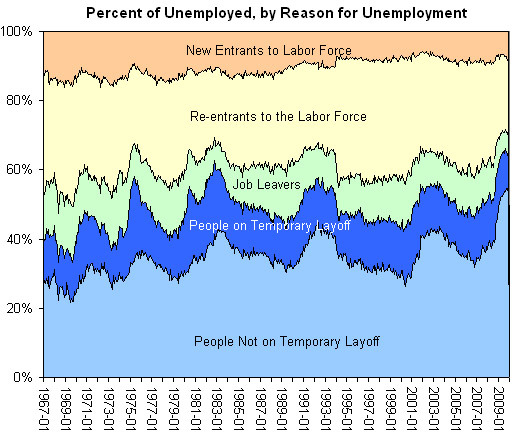 To get the unemployment rate down below, say, 7%, you have to take a big chunk out of long-term unemployment. It's true that the United States experienced a marvelous recovery in the mid-1980s, and there are lessons to learn from the past about stimulus and job creation, but it's important to point out that the demographics of the unemployed are very different today. Americans have lost jobs in companies or industry sectors that are not coming back. Here's another way to look at the picture, in a graph from the Bureau of Labor Statistics. Permanent job losses now account for half the jobless ranks, the highest on crecord. This graph very clearly demonstrates how over the last half century, the number of long-term unemployed has steadily inched up throughout booms and busts.